Show your compassion, love, and support for Breast Cancer Awareness this month with these adorable pink pot leaf products. Because cannabis remains illegal in some states, not every patient can access the medicine they need. With this in mind, it’s important that we stand with these individuals and fight with them and for them. Here are nine ways you can wear your pink cannabis leaf for National Breast Cancer Awareness Month. If you prefer to show your support for breast cancer patients around your neck, the My Ribbon Circle Necklace will do just that. Aside from having a silver cover, it has a nice gloss finish. Whether you are at home, at the gym, or out and about, you can show your support for the illegally healed with this tank. This varsity tee is adorable. You’re guaranteed to catch people’s eyes and let them know that you support breast cancer awareness. You don’t have to wear the pink leaf to show your support for breast cancer awareness. In fact, you can rep it proudly on your coaster. Moreover, you can let guests use them and allow them to show their love as well. Aside from being easy to clean, this coaster has a glossy face, which is perfect for setting drinks on. Overall, #illegallyhealed has some excellent gear. Being that October is here and for some that means it’s chilly out, this t-shirt hoodie will not only keep you warm but also show your support for breast cancer awareness. Not only should women support breast cancer awareness, but men should also show some love. By wearing this t-shirt, you can show compassion towards women that have had breast cancer as well as those who currently do. Although it’s a simple gesture, people will thank you for it. Time to break out the classic pot-leaf socks and represent former/current breast cancer patients everywhere. Regardless if anyone can see them or not, the fact remains that you are making the effort to show your support. Showing your support for breast cancer awareness on your head is equally as kind as showing it on your body. Not to mention, both men and women can sport the Pink Pot Trucker Hat proudly. 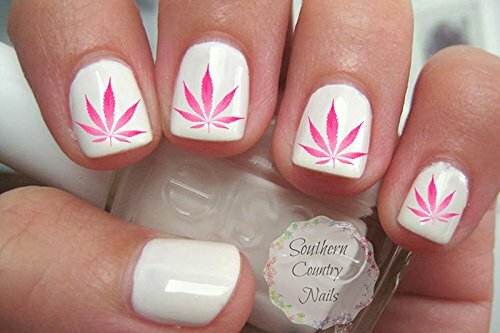 If you are someone who enjoys keeping your nails cute and colorful, these pink pot leaf nail stickers are the perfect way to support breast cancer awareness. Also, they’re affordable and easy to apply. Therefore, wearing your compassion for current/former breast cancer patients on your nails is a simple, yet thoughtful way to show off the pink leaf for National Breast Cancer Awareness Month.